Did you know that being friendly can make a profound difference to the well-being of others and ourselves? One of the most fundamental human needs is connection. Being friendly supports this and more, making people feel appreciated and respected. Acts of kindness actually have a positive physiological effect on the body. What is Be friendly in February? Be friendly in February is a calendar of suggestions set out by Action for Happiness (see more about this organisation below). The February calendar offers a suggestion for each day of the month to encourage us to take action and be friendlier to others in our everyday lives. So, what is the point exactly? Let’s take a look at what Action for Happiness represents. What is Action for Happiness? Action for Happiness are a movement of people committed to building a happier and more caring society. They believe there is a need to prioritise the things that cause happiness, including building positive relationships and looking after our mental health (both important contributors to happiness). 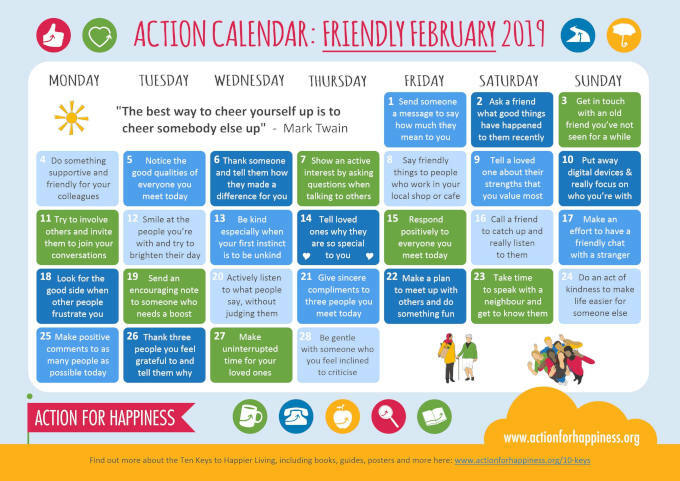 Every month Action for Happiness publish an action calendar based on a theme to encourage people to make a greater contribution to bringing about better, more caring communities. This month’s calendar is a humble reminder that it doesn’t take much to be friendlier towards family, friends, colleagues and even strangers. There are so many benefits to being friendly, and such kindness doesn’t have to be limited to the people we know. Treating everyone you meet in the same way as you would like to be treated will add meaning and significance to your life. There are many people experiencing relationship problems, feeling despair, and some who are lonely and/or suffering from anxiety or depression. Being friendly to someone, whether you are aware of any problems or not, can make such a difference to their day. A small act of kindness could do much more than you think. Being friendly makes you feel good and boosts your own happiness, as well as others. Generosity is hard-wired to the reward mechanism in our brain. Being kind to others is actually good for our own well-being. Altruistic behaviour releases endorphins (chemicals in the body that heal wounds, calm you down and make you feel good). One study by the Greater Good Science Center, UC Berkeley, found half of participants felt stronger and more energetic after helping others, and many felt calmer and less depressed. A report by Random Acts of Kindness states that perpetually kind people have 23% less cortisol (the stress hormone) and age slower than the average population! Being friendly isn’t just good for those on the receiving end, it’s good for the instigator too. Action for Happiness believe that helping others is the route to stronger communities and a happier society. Friendliness and kindness can have a domino effect. Why not take up the challenge and see what benefits being friendly in February can bring to you and those around you? It costs nothing, it could bring you the happiness you are searching for and it will have a positive impact on your physical and mental well-being. Talking to someone when you feel overwhelmed can be really helpful. If you’d like to speak to one of our experienced counsellors about any problems you are experiencing, get in touch today.